These are our Bengal cat rescue listings. This page contains a directory of rescues that focus strictly on Bengal cats and related mixes. Don't see your rescue here on this page? Is your rescue listed but there's an error in the listing? Enter the information below and list it with us for free. The Bengal Rescue Network (BRN) is a 501c3 non-profit, all volunteer organization working throughout the US and Canada. They also work with Bengal Cat Rescue UK by providing referrals. They do a have a listing on Petfinder, but I didn't see any available cats listed. Like many a pure breed rescue, they also have a Yahoo! Groups site: https://groups.yahoo.com/neo/groups/bengalcatrescue/info which seems to be active at the time of this writing. You can also reach them at the Bengal Rescue Network Facebook page. Part of the Bengal Rescue Network, rescue efforts are coordinated by Certified Cat Behavior Consultant Marilyn Krieger. She's a well-known cat behaviorist and Bengal cat advocate, known as The Cat Coach. "Great Lakes Bengal Rescue's (GLBR) mission is to find loving, permanent homes for Bengal cats who have been given to our Rescue." Founded by Janet Saltzman in 2007, GLBR serves Illinois, Indiana, Iowa, Michigan, Minnesota, Missouri, Ohio and Wisconsin using over 25 foster homes. Part of the Bengal Rescue Network, they serve New York, New Jersey, Pennsylvania, Vermont, Massachusetts, New Hampshire, Connecticut, Rhode Island and Maine. 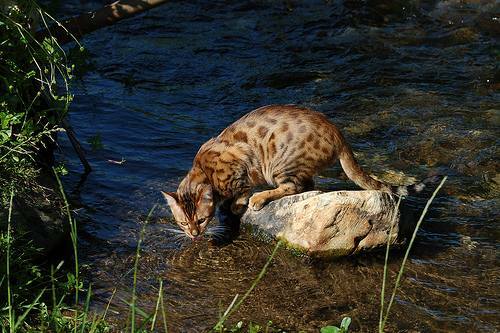 The Bengal cat is a hybrid cat breed. While the term "hybrid" is sometimes used to describe a breed that is created by the crossing of two or more distinct domestic cat breeds, here it has a different meaning. The Bengal is a cross between a wild cat, and a domestic. Specifically, the Bengal is a cross between an Asian Leopard cat and a domestic cat. The intent is to get a tame, sweet domestic, with the look of a wild cat. Those critical of this type of wild-to-domestic breeding practice often say that it comes with a price, and in certain circles, these cats may have a stigma attached to them. In some areas of the United States, cats with wild cat heritage, no matter how tame, are banned, so check your local laws prior to adopting. As always, before you adopt any cat, do your research, and spend time with the animal so that you know what you're getting into. Despite the claims by critics of hybrids with behavior problems, digestive issues, chronic diarrhea, and strong prey drive, fans of the breed say that many of these beautiful cats are leash trainable, and love to be with their humans.